The local hearth of the women’s group I’m in, The Daughters of the Sacred Grail, recently discussed judgment and judging. Even though people say “don’t judge,” the fact is that we do it all the time and it is part of assessing whether something or someone is right for us. Not everything is worthy of your time. Don’t buy too much into the negative understanding of the word judgment – it is key to helping you find your way. READING POINTS: The only thing in life that is assured is that if you wait long enough, it will change. How you survive that change and who you are after it is up to you. The major elements in this process is judgment of yourself and others. This may relate to an assessment regarding a personal matter or situation, and could be linked to the process of forgiving. It may also relate to a group or social decision. In the process of judgment, both as an individual an on the universal level, honesty is the key. Be honest, be forgiving, be patient, but most of all, be assred change is at hand. Remember, the universe has a long memory. Nothing is ever forgotten. DESCRIPTION: Between two yew trees lies an ancient burial mound of the kind known as a passage grave. Upon this a polar bear crouches, keeping watch. The initiate has been laid to rest, covered by earth and stone, and now wants to be reborn, guarded by the shamanic sentinel of the mound. The traditional religious and political concepts of right and wrong, guilt and innocence, have no place here, for the judgment that takes place during the time of rebirth is both inward and mystical, and yet outward and universal, reaching far beyond the narrow confines of human civilization and conventions. The constellation of the Great Bear stands out in the sky, indicating the entrance to the otherworld to which the seeker proceeds. Fear of death and damnation have mutated into a distorted view of the card known traditionally as Judgment, as a calling of righteous souls from their graves by an angel on Judgment Day. But the universe is much simpler than religious theologies would have it. The laws of evolution and cause and effect have more to do with diving judgment than human morals. If, on a personal level, life is squandered in the pursuit of vainglories and pretentious ambition, the painful void left within an individual’s soul will make itself known through despair and frustration. On the earthly or universal sphere, if we abuse the ecosystem and lay waste to world resources, nature will find a way to redress the balance by its own evolutionary means. Nature is not vindictive, just practical. By the same token, if time is spent education and understanding ourselves, this investment in wisdom will help us live our lives with a deeper respect for all humanity and nature. Life will be enriched by the joy and beauty of the universe. 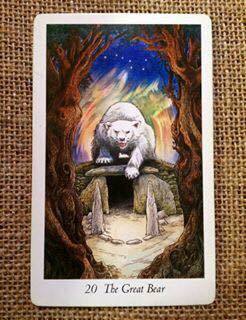 The Great Bear is the guardian of the forest ways and holds up the power of life and death over those who transgress those laws. After experiencing the stages of being stripped and laid bare, the initiate experiences renewed strength and wisdom and is reborn into a place of quiet stillness, peace, and rest that allows the healing process to be completed. The new, whole, reconstituted person lies hibernating, full of potential, ready to meet the coming spring and with energy and joy.